Contains catechins, a powerful antioxidants that are 200 times stronger than vitamin E. Antimicrobial properties, helps normalize vascular blood clotting and total cholesterol, supports healthy kidney function. 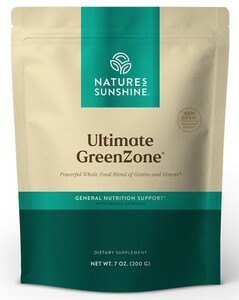 From NSP - Nature's Sunshine - Gluten-free, improves elimination, immunity, normalize cholesterol levels, pH-balancing. Gluten-Free, Whole Food Supplement - A Better Means to Get Your Greens--and Grains! Reducing cholesterol oxidation helps support healthy cardiovascular aging and circulatory function within the heart. From NSP - Nature's Sunshine - Alpha Lipoic Acid [Nervous, Glandular] is often called the universal antioxidant. Protects cell membrane. A powerful antioxidant. Very helpful for getting rid of excess estrogen and for any condition involving excess estrogen stimulation, including breast and reproductive cancers, uterine fibroids and fibrocystic breasts. Protects the body from free radical damage. Contains vitamins, minerals, herbs and vegetables that are known antioxidants and that have immune-protective and immuno-stimulant properties.